Introduction: Physicians are often challenged with accessing relevant up-to-date arthritis information to enable the delivery of optimal care. An online continuing medical education programme to disseminate arthritis clinical practice guidelines (CPGs) was developed to address this issue. Methods: Online learning modules were developed for osteoarthritis (OA) and rheumatoid arthritis (RA) using published CPGs adapted for primary care (best practices), input from subject matter experts and a needs assessment. The programme was piloted in two rural/remote areas of Canada. Knowledge of best practice guidelines was measured before, immediately after completion of the modules and at 3-month follow-up by assigning one point for each appropriate best practice applied to a hypothetical case scenario. Points were then summed into a total best practice score. Results: Participants represented various professions in primary care, including family physicians, physiotherapists, occupational therapists and nurses (n = 89) and demonstrated significant improvements in total best practice scores immediately following completion of the modules (OA pre = 2.8/10, post = 3.8/10, P < 0.01; RA pre = 3.9/12, post = 4.6/12, P < 0.01). The response rate at 3 months was too small for analysis. Conclusions: With knowledge gained from the online modules, participants were able to apply a greater number of best practices to OA and RA hypothetical case scenarios. The online programme has demonstrated that it can provide some of the information rural/remote primary care providers need to deliver optimal care; however, further research is needed to determine whether these results translate into changes in practice. Introduction: Il est souvent difficile pour les médecins d'accéder à de l'information pertinente et à jour sur l'arthrite dans le but de dispenser des soins optimaux. Un programme en ligne de formation médicale continue visant à disséminer les lignes directrices de pratique clinique sur l'arthrite a été créé pour résoudre ce problème. Méthodes: Des modules d'apprentissage en ligne sur l'arthrose et la polyarthrite rhumatoïde (PR) ont été élaborés à l'aide des lignes directrices de pratique clinique publiées ayant été adaptées pour les soins de première ligne (pratiques exemplaires), des commentaires des spécialistes en la matière et d'une évaluation des besoins. Le programme a été mis à l'essai dans deux régions rurales et éloignées du Canada. La connaissance des lignes directrices de pratique exemplaire a été mesurée avant, immédiatement après avoir terminé les modules et au suivi de trois mois en accordant un point à chaque pratique exemplaire appropriée appliquée à un scénario de cas hypothétique. La somme des points indiquait le score de pratique exemplaire. Résultats: Les participants représentaient diverses professions de première ligne, dont médecins de famille, physiothérapeutes, ergothérapeutes et infirmières (n = 89) et ont affiché une amélioration significative des scores totaux de pratique exemplaire immédiatement après avoir terminé les modules (arthrose avant = 2,8/10, après = 3,8/10, P < 0,01; PR avant = 3,9/12, après = 4,6/12, P < 0,01). Le taux de réponse à trois mois était trop faible pour l'analyse. Conclusions: Grâce aux connaissances acquises dans les modules en ligne, les participants ont pu appliquer un plus grand nombre de pratiques exemplaires aux scénarios de cas hypothétiques d'arthrose et de PR. Le programme en ligne a montré pouvoir fournir une part de l'information que les fournisseurs de soins en région rurale et éloignée ont besoin pour dispenser des soins optimaux, cependant des recherches plus poussées sont nécessaires pour déterminer si ces résultats se traduisent par des changements de la pratique. Arthritis and related conditions affect more than 6 million Canadians aged 15 years and older. Life with Arthritis in Canada estimates that the direct and indirect costs to the individual, the health care system and to society are $6.4 billion per year. Most treatment for people with arthritis occurs at the primary care level. In 2005–2006, arthritis accounted for close to 9 million physician visits. In many jurisdictions, primary care physicians often report difficulty in diagnosing the many forms of arthritis, have limited access to specialists and may not be aware of the benefits and availability of nonpharmacological interventions., They have been shown to lack confidence in their ability to assess and manage musculoskeletal (MSK) conditions and to be only moderately satisfied with their ability to deliver arthritis care. Getting a Grip on Arthritis (GRIP) was designed to address this gap. GRIP is a national, accredited, face-to-face (F2F), interprofessional, educational programme based on the clinical practice guidelines (CPGs) for osteoarthritis (OA) and rheumatoid arthritis (RA) and has been shown to increase health care providers' ability to manage arthritis,, and improve patient outcomes (exercise behaviour, appropriate medication use). GRIP was delivered through a workshop, 9 hours in length, which covered the differentiation of OA from RA and the pharmacological and nonpharmacological management of the two conditions. The average GRIP F2F workshop trained 30 providers (physicians, nurses and rehabilitation therapists) and cost approximately $20,000.00. The high cost, regardless of the demonstrated benefits, made it necessary to explore options that allowed the programme to be delivered more broadly and in a sustainable format. Online learning has been shown to effectively deliver continuing medical education (CME) to improve provider knowledge, skills, satisfaction and clinical practice behaviours. An online version of the GRIP programme would allow many more health care providers to be reached at a lower cost, particularly those working in rural or remote locations. Thirty per cent of Canadians live in rural, remote, northern and aboriginal communities, where the prevalence of arthritis is high compared to urban areas. Health care providers are scarce in these communities and their access to CME opportunities may be limited. Online learning is a preferred format for CME because it supports a self-directed approach, is cost-effective and is easily accessed, especially where professional constraints may prevent time away from work.,, Online learning has been shown to satisfy learners' needs and effectively deliver CME to improve provider confidence and practice,,, especially when compared to no intervention. In keeping with this, the goals of this project were to (1) identify the needs of primary care providers who treat arthritis in rural and remote regions of Canada, (2) develop an accredited online version of the GRIP programme (GRIP Online) focusing on the evidence-based management of RA and OA in rural settings and (3) pilot test the programme in two remote regions of Canada. Specifically, we were interested in whether the GRIP Online programme would improve primary care providers' recommendations/adherence to arthritis best practices and increase confidence and satisfaction with their ability to manage arthritis. A needs assessment was conducted to identify priority content for two online educational modules on RA and OA. A design team consisting of researchers, multidisciplinary primary care providers, educators and adults with arthritis developed online surveys (French and English), one for primary care providers and one for the public. Questions were based on the GRIP best practice guidelines for OA and RA which were developed in 2000 from CPGs and then updated by the Cochrane MSK Disease Group in 2012. Members of six national groups (Society of Rural Physicians of Canada, Canadian Kinesiology Alliance, Canadian Association of Community Health Centres, Arthritis Health Professions Association, First Nations and Inuit Home and Community Care Programme, Arthritis Society) were invited by their organisations to complete the online surveys. The survey URL was sent by e-mail and/or posted on their websites and distributed through their newsletters and through eblasts. Several evidence-based strategies were used to increase survey response rates: providing prenotification, two reminder e-mails, a deadline for survey completion and an incentive (opportunity to win a $50 Chapter's gift card). The provider survey asked participants to rate arthritis best practices in terms of their priority for online learning. Ratings of educational priorities (1 = lowest priority and 10 = highest priority) were compared by urban/rural status. Providers were also asked to rate their confidence with various aspects of arthritis care and satisfaction with their ability to manage arthritis on a numerical rating scale (1 = not satisfied/confident/and 10 = extremely satisfied/confident). Potential unperceived provider needs were captured through a modified version of the survey distributed to patients through the communications channels of three patient organisations: Patient Partners® in Arthritis, the Consumer Advisory Council of the Canadian Arthritis Network, and the Arthritis Society. The GRIP Online programme was developed based on the results of the needs assessment, published guidelines for OA,,, and RA,,,,,, and input from multidisciplinary subject matter experts on OA and RA from across Canada, including two members of the Society of Rural Physicians of Canada. The programme was piloted over a 6-week period in two rural/remote areas of Canada with documented high arthritis prevalence and shortages of health care professionals (Northwestern Ontario Local Health Integration Network and the Newfoundland and Labrador Central Regional Health Authority). Recruitment was targeted and done through the six national partner groups identified above. Several methods were used to evaluate the programme. All participants completed a survey on their satisfaction with the programme design and content immediately after completing the programme and 3 months later. Participants also completed a modified version of the Arthritis Community Research and Evaluation Unit Primary Care Survey which measures confidence and satisfaction with the ability to manage arthritis (rated on a numerical rating scale of 1–10; 1 = not at all confident/satisfied and 10 = extremely confident/satisfied) and participant's application of best practices to two hypothetical case scenarios: moderate knee OA and an early presentation of RA. Best practices included recommendations on: exercise/physical activity; patient education; weight management; occupational therapy (OT)/joint protection/energy conservation; use of assistive devices; psychosocial support; pain medication; anti-inflammatory medication and joint injections for both OA and RA. Surgical consult was added for OA and rheumatology referral, corticosteroids, and disease-modifying anti-rheumatic drugs (DMARDs) were added for RA. Best practices were evaluated by (1) assigning one point for each correct best practice applied to the case scenario and summing the points into a total best practice score for each participant (total possible scores for OA and RA were 10 and 12, respectively) and (2) the percentage of participants who applied each best practice to the case scenarios. Survey responses were exported to SPSS (IBM Canada Ltd. SPSS Statistics, V. 24 Markham Ontario, Canada) and analysed using descriptive statistics (means, median and proportions). Results were analysed before (pre) and immediately following completion of the programme (post) using nonparametric statistics where appropriate. Those participants indicating that the best practice was 'not in scope' were removed from the analysis. Unfortunately, the sample size for the 3-month follow-up survey was low (OA: 11 and RA: 14) precluding meaningful comparisons with baseline. P < 0.05 was considered the level of statistical significance. Changes were determined to be clinically significant if the immediate post-programme scores were ≥15% compared to baseline. A 15% improvement is greater than the 10% median improvement reported by Grimshaw et al. in a large-scale review of guideline implementation strategies and is less than the percentage expected for the improvement in clinical trials evaluating arthritis medications. This project received ethics approval from the Health Research Ethics Authority (HREA #13.067), Newfoundland and Labrador and McMaster University. Participants' written informed consents were received to publish the results of both the needs assessment and the evaluation of the online programme. Responses to the needs assessment survey were received from 333 providers (rural/remote = 38.9%) and reflected the multidisciplinary arthritis care team: physicians (50.2%), physiotherapists (13.2%), nurses/nurse practitioners (10.5%), occupational therapists (7.5%) and 'others' (18.6%). Providers were mostly female (73.3%), worked full time (71.6%) and were moderately confident with their ability to manage most aspects of arthritis care; however, confidence in using/recommending DMARDs for RA was low (median: 4/10; n = 192). Confidence was generally similar for providers working in urban and rural settings; however, rural providers were more confident in using/recommending corticosteroids and joint injections (Mann–Whitney U-test, P < 0.01). The best practices that were rated the highest priority for online learning were OT/joint protection/energy conservation, self-management education and pain/anti-inflammatory medications as well as DMARDs and referral to rheumatology for RA (median rating ≥7/10). Ratings were similar across urban/rural status; however, guidelines for referral to rheumatology for RA were a lower educational priority for rural respondents (Mann–Whitney U-test, P < 0.05). Physicians rated surgical referral and joint injections as topics with higher priorities than other disciplines (P < 0.05). The patient survey resulted in 93 responses (rural/remote = 31.1%). Most respondents were female (89.3%) in the 18–64-year-old age group (83.1%) and most had either RA (45.4%) or OA (26.3%). Respondents rated all best practices as important (median ≥7.9/10), and there were no significant differences in the median rating based on urban/rural status, diagnosis (RA versus OA) or age (≤64 vs. 65 + years) (Mann–Whitney U-test, P > 0.05). The online programme was then developed and hosted by Memorial University through MDcme.ca and was offered at no cost by the Arthritis Society. The two modules used 'real-life' cases and incorporated branching scenarios that presented questions, allowed participants to choose actions and then see a patient response. They incorporated self-assessment techniques and a combination of text, audio, videos, graphics and links to public and provider online learning tools and resources. References and links to the current CPGs for RA and OA were embedded in the modules. An 'Ask the Expert' feature and a discussion board were put in place and facilitated by physician subject matter experts. The learning objectives for the programme are outlined in [Table 1]. During the pilot, 89 rural primary care providers, representing a mix of disciplines, including physiotherapists (44%), nurses (31%), family physicians (12%), occupational therapists (7%) and others (6%), registered for the online programme over the 6-week period (Northwestern Ontario: n = 61; Central Region of Newfoundland and Labrador: n = 28). Of the total, 35 participants completed both pre- and post-assessments of the OA module and 31 completed the assessments of the early RA module. A majority of respondents agreed that the modules were consistent with stated objectives (OA = 97.5% and RA = 97.1%), addressed their learning needs (OA = 87.2%; RA = 94.3%), were relevant to practice (OA = 80.0% and RA = 91.4%) and were credible and nonbiased (OA = 100%; RA = 97.1%). Participant feedback also highlighted the need for additional information relevant to professions other than physicians to better capture the importance of multidisciplinary care. This feedback was incorporated into the final accredited version of the programme. [Table 2], [Table 3], [Table 4] present the results of the evaluations of the participants of the GRIP online pilot project. Participant satisfaction with the ability to manage arthritis improved significantly immediately following both the OA and early RA modules (Wilcoxon signed-rank test; P < 0.05) [Table 2]. The improvement for RA was also clinically important (16.7%). Participants also reported significant and clinically important improvements in confidence for recommending or prescribing corticosteroids (OA: 100.0% and RA: 33.3%). 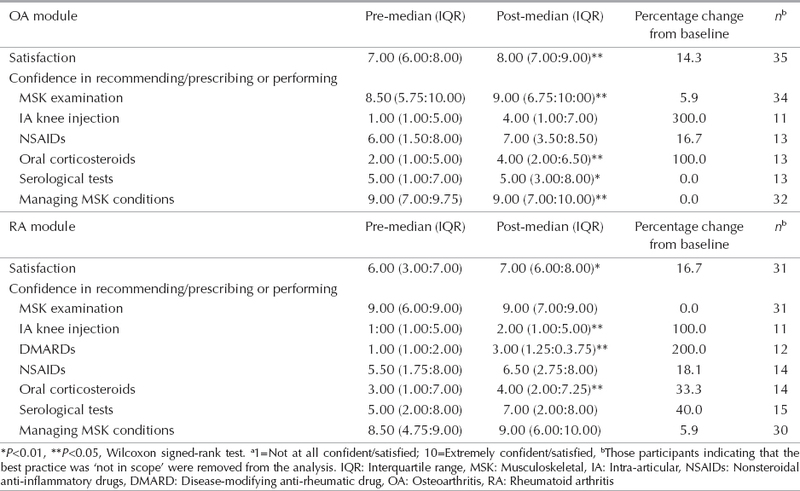 Immediately following the OA module, participants also reported significant improvements in confidence for completing the MSK examination, ordering serologic tests and managing common MSK conditions (P < 0.05). Improvements in recommending a knee injection and nonsteroidal anti-inflammatory drugs (NSAIDS) were clinically important (300.0% and 16.7%, respectively). Following the early RA module, improvements in confidence in recommending/prescribing knee intra-articular injections and DMARDs were both statistically significant and clinically important (100.0% and 200.0%, respectively) although final confidence levels were still relatively low. [Table 3] compares the baseline and immediate post-programme total best practice scores and specific best practice recommendations for the participants who completed an evaluation of the OA module. The programme resulted in a 35.7% improvement in total best practice scores for OA (paired samples t-test; P < 0.01) and more participants selected OT/joint protection/energy conservation as a best practice following the programme, an improvement of 81.5% (McNemar's test; P < 0.05). There were also clinically important improvements for several other best practices, namely, assistive devices (100.0%), weight management (80.3%), analgesics (100.0%) and NSAIDs (50.2%). There was also a clinically significant reduction in the number of people who recommended surgical consults (−37.4%). [Table 4] compares the baseline and immediate post-programme total best practice scores and specific best practice recommendations for the participants who completed the evaluation of the early RA module. Total best practice scores for the RA module improved by 17.9% immediately following completion of the module (paired samples t-test; P < 0.01) and more providers selected education as a best practice for the client in the RA case scenario, an improvement of 46.7% (McNemar's test; P < 0.05). Clinical improvements were seen for several other best practices, namely, exercise (16.0%), OT (23.0%), weight management (33.0%), social support (60.3%) and DMARDs (198.4%). There was also a clinically significant reduction in the percentage of respondents recommending NSAIDs for this scenario (−27.3%). The GRIP Online programme, developed with the input of rural health care providers and people with arthritis, was successfully implemented over the 6-week pilot phase in two remote/rural locations in Canada. The programme addressed priorities for online education identified in our needs assessment and met programme goals by improving provider satisfaction and confidence in their ability to assess and manage several components of arthritis care. A multidisciplinary mix of rural participants, including physicians, indicated that the programme addressed their learning needs and was relevant to practice. Despite our small sample, improvements were seen in some aspects of arthritis care, namely, satisfaction with the ability to manage arthritis and total best practice scores. This suggests a potential to improve the overall management of arthritis. For OA, participants' confidence in performing a comprehensive MSK examination and in managing common MSK conditions improved significantly. This was coupled with a reduction in the number of referrals for surgical consults. This is promising since most OA can be managed conservatively at the primary care level, potentially resulting in fewer referrals to specialists and savings for the health care system. For RA, participants' confidence in prescribing/recommending DMARDs improved significantly. If DMARDs are initiated early, this might result in improvements in outcomes for people with RA.,, However, despite improvements following the programme, confidence remained low for prescribing DMARDs for RA and also for performing intra-articular injections. These results might suggest priorities for future F2F CME. The study was limited because of the small sample size. However, these numbers were considered adequate for a pilot study (>30/group). There was no control group or randomisation; therefore, the results are subject to several biases in terms of subject selection and the risk of cointervention that might influence outcomes. Evaluating the effectiveness of the intervention requires the Canada-wide implementation of the programme using a randomised controlled trial. A larger sample would allow subgroup analysis and generalisation to physicians and other provider groups working in rural settings across Canada. Long-term follow-up is needed to determine if practice change has occurred and resulted in improved patient outcomes. This project resulted in the development of two accredited online modules on OA and RA, based on the learning priorities of rural providers, and was successfully pilot tested in two underserviced regions of Canada. Results showed that the programme was relevant to a mix of disciplines working in primary care settings and suggest that this online programme might successfully disseminate arthritis CPGs and improve the nonpharmacological and medical management of arthritis in practice. GRIP Online was accredited (Mainpro-M1) and launched nationally in February of 2014 (http://www.mdcme.ca/grip). Since the launch of the programme, over 1250 primary care providers have registered for the OA programme and over 900 have registered for the RA programme, suggesting that this may be a viable and accessible option for improving the management of arthritis, particularly for providers working in rural and remote communities. Acknowledgements: We would like to thank the following for their assistance and support. Project partners: Arthritis Health Professions Association, Arthritis Society, Canadian Arthritis Network Consumer Advisory Council, Canadian Association of Community Health Centres, Canadian Kinesiology Alliance, Canadian Orthopaedic Foundation, Cochrane MSK Disease Group, First Nations and Inuit Home and Community Care Programme, Patient Partners® in Arthritis and the Society of Rural Physicians of Canada. Dawn Richards, Lori Cyr, Karen Gordon, Wendy Soden, Dr. Ken Stakwi, Dr. Mich Whittle, Dr. Stewart Wright, Becki Zerr. Financial support and sponsorship: This work was supported by a Knowledge to Action Grant from the Canadian Institutes of Health Research (CIHR), grant #262599. Conflicts of interest: There are no conflicts of interest. Status of Arthritis in Canada: Statistics Guide. Toronto, Ontario: Arthritis Community Research and Evaluation Unit; 2018. O'Donnell S, Lagacé C, McRae L, Bancej C. Life with arthritis in Canada: A personal and public health challenge. Chronic Dis Inj Can 2011;31:135-6. Cottrell E, Foster NE, Porcheret M, Rathod T, Roddy E. GPs' attitudes, beliefs and behaviours regarding exercise for chronic knee pain: A questionnaire survey. BMJ Open 2017;7:e014999. Cottrell E, Roddy E, Rathod T, Porcheret M, Foster NE. What influences general practitioners' use of exercise for patients with chronic knee pain? Results from a national survey. BMC Fam Pract 2016;17:172. Lineker SC, Bell MJ, Badley EM. Evaluation of an inter-professional educational intervention to improve the use of arthritis best practices in primary care. J Rheumatol 2011;38:931-7. Glazier RH, Badley EM, Lineker SC, Wilkins AL, Bell MJ. Getting a grip on arthritis: An educational intervention for the diagnosis and treatment of arthritis in primary care. J Rheumatol 2005;32:137-42. Lineker SC, Bell MJ, Boyle J, Badley EM, Flakstad L, Fleming J, et al. Implementing arthritis clinical practice guidelines in primary care. Med Teach 2009;31:230-7. Cook DA, Levinson AJ, Garside S, Dupras DM, Erwin PJ, Montori VM, et al. Internet-based learning in the health professions: A meta-analysis. JAMA 2008;300:1181-96. Rural Health in Rural Hands: Strategic Directions for Rural, Remote, Northern and Aboriginal Communities; 2002. Available from: http://www.publications.gc.ca/site/eng/9.689374/publication.html. [Last accessed on 2019 Jan 02]. Wang AT, Sandhu NP, Wittich CM, Mandrekar JN, Beckman TJ. Using social media to improve continuing medical education: A survey of course participants. Mayo Clin Proc 2012;87:1162-70. Donavant BW. The new, modern practice of adult education: Online instruction in a continuing professional education setting. Adult Educ Q 2009;59:227-45. LeNoue HT, Eighmy MA. Adult education and the social media revolution. Adult Learn 2011;22:4-12. Curran VR, Fleet L. A review of evaluation outcomes of web-based continuing medical education. Med Educ 2005;39:561-7. Curran V, Lockyer J, Sargeant J, Fleet L. Evaluation of learning outcomes in web-based continuing medical education. Acad Med 2006;81:S30-4. Cook DA. The failure of e-learning research to inform educational practice, and what we can do about it. Med Teach 2009;31:158-62. Edwards PJ, Roberts I, Clarke MJ, DiGuiseppi C, Wentz R, Kwan I, et al. Methods to increase response to postal and electronic questionnaires. Cochrane Database of Systematic Reviews 2009;(3). DOI: 10.1002/14651858.MR000008.pub4. Zhang W, Doherty M, Arden N, Bannwarth B, Bijlsma J, Gunther KP, et al. EULAR evidence based recommendations for the management of hip osteoarthritis: Report of a task force of the EULAR standing committee for international clinical studies including therapeutics (ESCISIT). Ann Rheum Dis 2005;64:669-81. Zhang W, Nuki G, Moskowitz RW, Abramson S, Altman RD, Arden NK, et al. OARSI recommendations for the management of hip and knee osteoarthritis: Part III: Changes in evidence following systematic cumulative update of research published through January 2009. Osteoarthritis Cartilage 2010;18:476-99. Recommendations for the medical management of osteoarthritis of the hip and knee: 2000 update. American college of rheumatology subcommittee on osteoarthritis guidelines. Arthritis Rheum 2000;43:1905-15. Brosseau L, Wells GA, Tugwell P, Egan M, Dubouloz CJ, Casimiro L, et al. Ottawa panel evidence-based clinical practice guidelines for the management of osteoarthritis in adults who are obese or overweight. Phys Ther 2011;91:843-61. Luqmani R, Hennell S, Estrach C, Basher D, Birrell F, Bosworth A, et al. 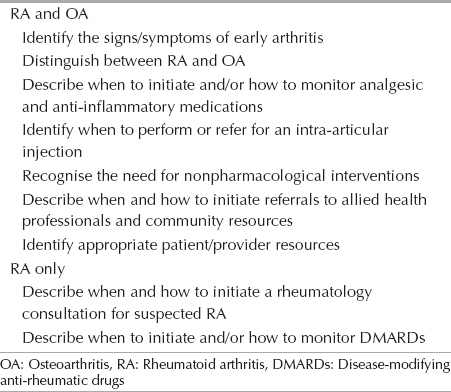 British society for rheumatology and British health professionals in rheumatology guideline for the management of rheumatoid arthritis (after the first 2 years). Rheumatology (Oxford) 2009;48:436-9. Saag KG, Teng GG, Patkar NM, Anuntiyo J, Finney C, Curtis JR, et al. American college of rheumatology 2008 recommendations for the use of nonbiologic and biologic disease-modifying antirheumatic drugs in rheumatoid arthritis. Arthritis Rheum 2008;59:762-84. Department of Health and Human Services. The Management of Rheumatoid Arthritis in Adults. United States: Department of Health and Human Services; 2011. British Columbia Ministry of Health, Services Guidelines and Protocols Advisory Committee. Rheumatoid Arthritis: Diagnosis and Management. 2012. Available from: https://www2.gov.bc.ca/gov/content/health/practitioner-professional-resources/bc-guidelines/rheumatological-and-musculoskeletal-systems. [Last accessed 2019 Jan 23]. Bykerk VP, Baron M, Boire G, Haraoui B, Khraishi M, LeClercq S, et al. Canadian consensus statement on early optimal therapy in early rheumatoid arthritis 2004;14:11-3. Scottish Intercollegiate Guidelines Network. Management of Early Rheumatoid Arthritis- A National Clinical Guideline. 2011. Available from: https://www.sign.ac.uk/sign-123-management-of-early-rheumatoid-arthritis.html. [Last accessed on 2019 Jan 28]. Deighton C, O'Mahony R, Tosh J, Turner C, Rudolf M; Guideline Development Group. Management of rheumatoid arthritis: Summary of NICE guidance. BMJ 2009;338:b702. Glazier RH, Dalby DM, Badley EM, Hawker GA, Bell MJ, Buchbinder R, et al. Management of the early and late presentations of rheumatoid arthritis: A survey of ontario primary care physicians. CMAJ 1996;155:679-87. Grimshaw JM, Thomas RE, MacLennan G, Fraser C, Ramsay CR, Vale L, et al. Effectiveness and efficiency of guideline dissemination and implementation strategies. Health Technol Assess 2004;8:iii-iv, 1-72. Felson DT, Anderson JJ, Boers M, Bombardier C, Furst D, Goldsmith C, et al. American college of rheumatology. Preliminary definition of improvement in rheumatoid arthritis. Arthritis Rheum 1995;38:727-35. Pyne L, Bykerk VP, Boire G, Haraoui B, Hitchon C, Thorne JC, et al. Increasing treatment in early rheumatoid arthritis is not determined by the disease activity score but by physician global assessment: Results from the CATCH study. J Rheumatol 2012;39:2081-7. Harris JA, Bykerk VP, Hitchon CA, Keystone EC, Thorne JC, Boire G, et al. Determining best practices in early rheumatoid arthritis by comparing differences in treatment at sites in the Canadian early arthritis cohort. J Rheumatol 2013;40:1823-30. Haraoui B, Bensen W, Thorne C, Wade J, Deamude M, Prince J, et al. Treating rheumatoid arthritis to target: A Canadian patient survey. J Clin Rheumatol 2014;20:61-7. Grol R, Grimshaw J. From best evidence to best practice: Effective implementation of change in patients' care. Lancet 2003;362:1225-30. Sargeant J, Curran V, Jarvis-Selinger S, Ferrier S, Allen M, Kirby F, et al. Interactive on-line continuing medical education: Physicians' perceptions and experiences. J Contin Educ Health Prof 2004;24:227-36. Young KJ, Kim JJ, Yeung G, Sit C, Tobe SW. Physician preferences for accredited online continuing medical education. J Contin Educ Health Prof 2011;31:241-6. Curran VR, Fleet L, Kirby F. Factors influencing rural health care professionals' access to continuing professional education. Aust J Rural Health 2006;14:51-5.